First, cheers to the cashier at the Sobey’s at Queensway east of Park Lawn, who this morning was spreading joy to her customers with a winning smile and a little conversation. Awesome! On the other hand there was the clerk at the gas station at Queensway and Windermere yesterday morning. 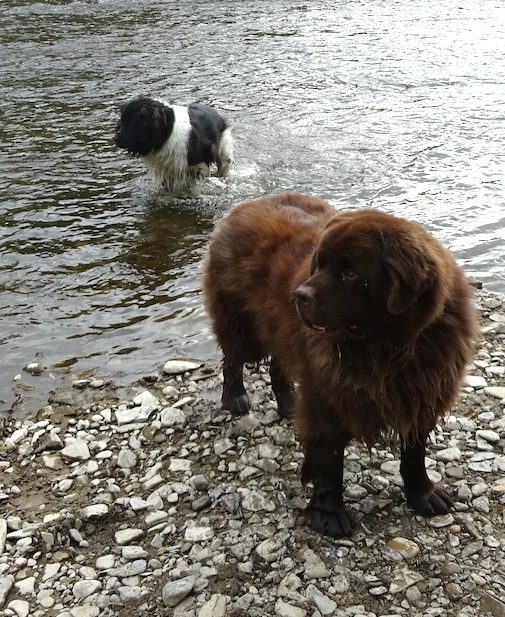 I was on my way to take the Newfs to Lorraine, our super-fantastic groomer for a much-needed bath and full groom. I filled up with gas and went into the store to buy a cold drink. There was one fellow behind me in line and as I was waiting, I put my hand down on the counter – and unfortunately into a waiting blob of white goo that I’m guessing was dripping ice cream from a previous day. I asked the clerk for a paper towel. He didn’t understand what had happened and pointed out which aisle in his store held the paper towels. I explained that, no I didn’t want to buy paper towels. I showed him my gooey hand and said I needed to clean up. He produced a roll of paper towels and tore off a piece for me. I cleaned my hand – and his counter – as best I could, leaving the residue paper towel on the counter, as I knew there was a garbage behind the counter. I paid for my drink and was about to depart, when buddy tells me in a really condescending way to take my paper towel and deposit it in the garbage outside. If he had anything to say, “sorry about the mess on the counter” seemed more appropriate. So I said, look I cleaned up your mess, and he said it’s not my mess and I said, I’m your customer, this is your store and it’s for sure not my mess. I think he was getting angry. It’s my store, he said, but it’s not my mess. I wanted to tell him that had he kept his store in a clean and sanitary condition, I wouldn’t have mysterious white goo on my hand, but instead, at that point I just left. Maybe I should have just smiled, wished him a good day, and taken the paper towel with me.